The School Culture Opportunities for Positive Engagement (SCOPE) Review was initiated in 2010 to reinvigorate the Caroline Chisholm School (CCS) House System. After the SCOPE committee was formed, it concluded that the School House System was, and remains an integral part of the school and forms the backbone of the school's positive incentive scheme and achievement strategy. With this thought in mind Caroline Chisholm School's new House System was created. The objective was to encompass an amalgamated P-10 school and students were asked to nominate the theme and House names, and voting was carried out by the whole school. The winning entry was created by Sarah Crimmins (Yr6 2010). Why did you choose this entry? What is the significance? 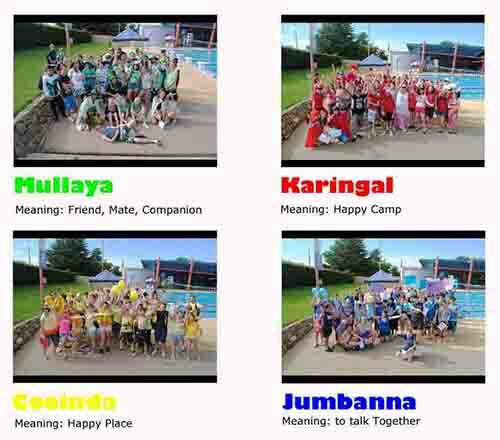 I chose this idea because all these words relate to happiness, friendship and team work. They are also in the language of the local Ngunnawal people. Aligning with CCS's school values and vision, the House System aims to develop the whole child. The reinvigorated system seeks to increase participation and school pride at school events, motivate students to focus on learning and increase school community engagement and participation resulting in stronger learning outcomes for students. The new initiatives created through the House System have increased student enthusiasm, which has been noted both by our whole school community and members of the public. Our students and staff constantly try to conjure up creative ways to earn more points for their respective Houses. School Pride is increasingly evident at CCS: from the main-street conversations about who will have the most students at the School Social (earning House Points for Citizenship) to which staff member has the wackiest outfit ready for the Athletics Carnival (which would earn House Points for Participation). The vibe of our school is buzzing with enthusiasm! The students and staff at Caroline Chisholm School should be very proud of their efforts in ensuring the continued success of our amazingly unique House System. These points contribute to the whole House Points tally. In addition, as students move into the Senior Years Programme, the House Points a student earns also contribute towards their Individual of Recognition Program - iRap. Graduation Points recognise those Senior Years students who go above and beyond within their learning, school and community. Everyone who successfully completes Senior Years will get a School Certificate. However, for those who go above and beyond and collect Graduation Points, you are able to Graduate with extra recognition. Junior Campus - In year 5, 1 House Captain is elected by their peers for each house. These students work closely with the House Leaders in year 6 as well as the House Captains on the Senior Campus. Senior Campus - In year 10, 2 House Captains are elected by their peers for each house. 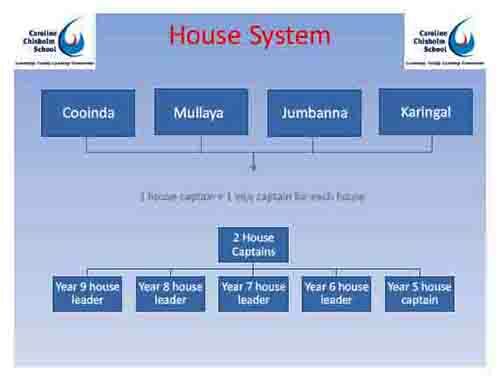 There are also elections for 1 House leader from each subsequent year group for each house, also elected by their peers. House Captains and House Leaders have the opportunity to attend leadership excursions to understand their role and build on their skills. Throughout the school year, they are involved in all sports carnival events, as well as organising and running fundraising activities. They are required to meet regularly with their House Patrons to discuss different activities and themes for various events throughout the year which they take charge of. House Captains will also need to make announcements at assembly about upcoming events as well as utilise the House Notice Boards. Even though we have House Captains and House Leaders at the forefront, each student at Caroline Chisholm School is expected to contribute to their House Spirit and take responsibility for claiming their house points.